The NH Collection Madrid Palacio de Tepa is set in a beautiful 19th century palace, originally designed by the architect of the Plaza Mayor, Juan de Villanueva. The hotel was awarded with the European Hotel Design Award in 2012, in the category of Renovation & Restoration after the complete rehabilitation of the building by Ramón Esteve. The hotel features 83 gorgeous and spacious guestrooms with beautiful hardwood floors. All are filled with natural light, while some overlook the quaint Plaza del Angel and Plaza de Santa Ana squares below. Guests can stay connected though complimentary WiFi, work out in the 24-hour fitness center, or unwind with a massage. Nestled in the bohemian district of Las Letras, the historic center of Madrid’s literary scene and one of the most cosmopolitan areas today, the hotel is the perfect starting point to explore the city. The outstanding location is in walking distance to historic landmarks and notable museums such as Prado Museum, Queen Sofia Art Centre, and Thyssen. Adjacent to the capital city's "Santa Ana Plaza," guests are in walking distance to everything Madrid has to offer. The hotel was originally built for the Earl of Tepa, who was the last Viceroy of Spain to be positioned in Mexico. 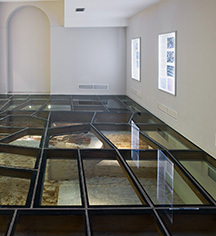 Remnants of the city’s 16th century canal system are preserved beneath the hotel. Airport Transportation: An airport shuttle may be arranged through the hotel's concierge, rates apply. Contact the property in advance to get details. Cribs and Pack-in-Plays: Contact hotel in advance to reserve a crib. Early Check-In/Late Check-Out: Available, depending upon availability. Late check-out is complimentary most Sundays. Hotel/Resort Fees & Taxes: Cash transactions at this property cannot exceed EUR 2500, due to national regulations. Fees and deposits may not include tax and are subject to change. Parking: On-site parking is available for a fee of EUR 33 per day. Rollaways: Please contact hotel in advance to reserve a rollaway bed. Shuttle Service: Shuttle service to and from the airport may be scheduled through the resort's concierge. Contact the property in advance to get details. 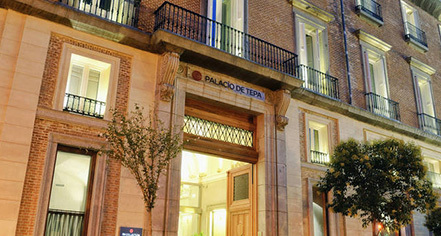 Learn more about the History of NH Collection Madrid Palacio de Tepa .